The IAFP office will be closed Dec. 23, 26, 30 and January 2. 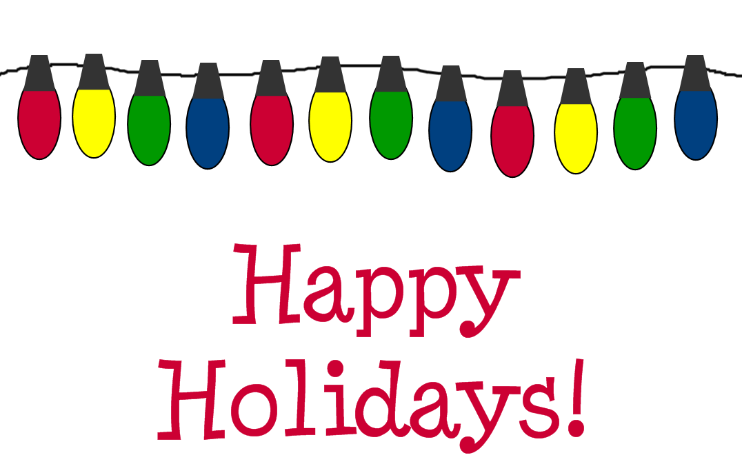 We wish you all a safe, healthy and peaceful holiday. 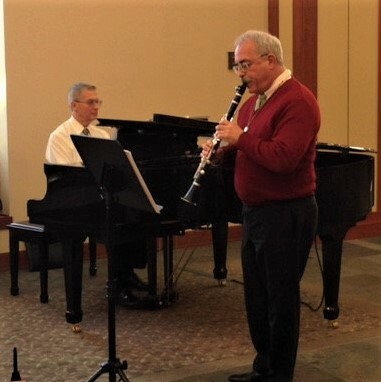 Check out the photo of IAFP president Donald Lurye, MD performing at Elmhurst Hospital on the clarinet Wednesday, Dec. 14. IMPORTANT NOTE FOR LOGGING INTO WWW.IAFP.COM. Due to an error discovered in our database structure, some IAFP members were not able to be successfully imported into IAFP's database. In order to completely import our membership data from AAFP, we needed to change ALL members' USER NAME. When you log into www.iafp.com, please use your email address as your user name. Members passwords have not been changed. Once you've successfully logged in, you have the option to change your user name to anything you wish. Show us your family medicine! IAFP is looking for genuine photos of our members doing what they do best! 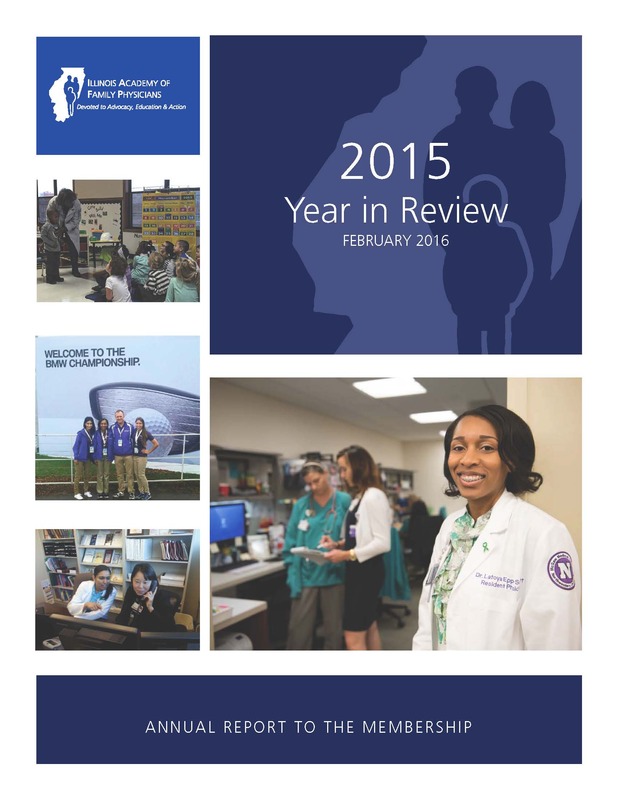 Each year the IAFP Annual Report features photos on the cover submitted by our members. Additional great photos find their way onto other pages of the publication! Check your files, check with your marketing department and email us your favorite family medicine image of the year. -Providing care in a unique setting such as mission trips, sporting events, mobile units, family medicine is everywhere! -Teaching students, residents, other physicians, high school students, boy scouts, anything! Now is the time to share your talents, expertise or your passion for learning with your Academy. 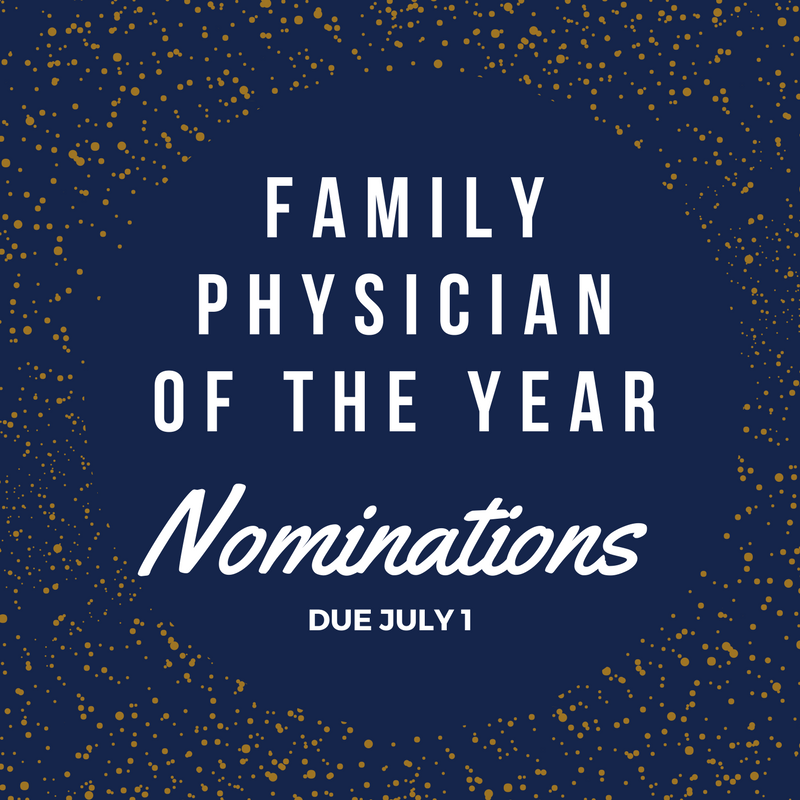 Check out the list of committees and task forces and apply for the one(s) that fuel your family medicine interests. The online application is simple and then IAFP staff will follow up with you after the New Year. Deadline is January 3, 2017. IDPH has been working to confirm with local health department sites that will continue to serve CHIP clients. Link to an updated list of those who will or won't continue to accept CHIP referrals for vaccines. .
As a reminder, all IAFP members who participate in the Vaccines for Children program are asked to complete this three-minute survey by December 16. Early Opportunities for Collaboration and Education in 2017 IAFP is proud to host and co-host three unique events in early 2017 - each has CME and incredible netowrking opportunities. Click on each link to learn more. Registration is open for the Ten State Conference! Need some CME? IAFP's online CME modules are always available to you for free! There is still time to get your 2016 donation to the IAFP Foundation! You can donate quickly and securely using our secure online form. IAFP submitted a second letter this week asking the Joint Commission on Administrative Rules (JCAR) to adopt the IDPH rules on Immunization requirements for children across the care settings. JCAR set to meet January 10. AAFP members need to inform their legislators in the U.S. Congress about the value of the Teaching Health Center Graduate Medical Education (THCGME) Program and urge them to make this important program sustainable. The innovative THCGME Program is a proven success, including Northwestern McGaw Family Medicine Residency in Chicago. With over 500 primary care physicians and dentists trained at 60 different sites, THCGME is instrumental in addressing the shortage in primary care. And given that THC residents are 3 to 4 times more likely to stay in underserved communities, this program is helping to place physicians in the areas that need help the most. While this program is recognized as a success, its funding expires September 30, 2017. Rep. David Reichert (R-WA-8) and Rep. Earl Blumenauer (D-OR-3) have introduced H.Res. 899, which expresses support for a stable and sustainable funding source for the THCGME program. Rep. Jan Schakowsky (D-9) is currently the only Illinois co-sponsor of this resolution. Use AAFP's Speak Out system to tell your representative to support the THCGME program (H.Res. 899). As we enter this transition period between the old and new Congress, there is great potential for movement in Washington. Send this prewritten letter to your legislator now to help ensure this vital program continues to train physicians where they are needed most. Physician groups, including AAFP issues a joint statement applauding the report from U.S. Surgeon General Vivek Murthy, MD. "While adolescent use of tobacco has declined since the 1970s, tobacco use continues to be a major health threat to young people and adults, and e-cigarettes are threatening to addict a new generation to nicotine. The developing brains of children and teens are particularly vulnerable to nicotine, which is why the growing popularity of e-cigarettes among adolescents is so alarming and dangerous to their long-term health." Check out the interactive web site with new resources to help you make the case with the kids in your home or your practice that e-cigarettes are a bad idea that can lead to many consequences. CTFK releases Broken Promises report Illinois is ranked a dismal 35th in state spending on tobacco prevention and cessation efforts in the annual Campaign for Tobacco-Free Kids annual "Broken Promises" report. While only investing 9.1 million per year in fighting tobacco use, our state spends 5.49 Billion in health care costs directly tied to tobacco related illnesses. Effective February 1, 2017, the Department will terminate any Medicaid provider that was enrolled prior to February 1, 2012, and has not revalidated their information through the IMPACT system. Although provider information will remain in IMPACT as "In-Process" for at least 30 days, all claims and encounters submitted by a terminated provider will be rejected. Terminated providers will be required to submit a new Medicaid provider enrollment through IMPACT and the earliest possible begin date will be the date the new enrollment is submitted. Body mass index reduction in children with overweight and obesity can be challenging. Learn how to address these issues in your practice with ICAAP's upcoming MOC activity Identification and Management of Psychosocial Stressors in Children with Overweight and Obesity. Participants will learn about the cyclical connection between toxic stress and obesity as well as practical tips on how to screen, counsel, and refer for one focused psychosocial stressor of their choice. To register or for more information, please contact Mary Elsner, Director of Obesity Prevention Initiatives, at 312/733-1026 x237 or [email protected]. This activity is funded by a grant from the Illinois Department of Healthcare and Family Services and the Otho S. A. Sprague Memorial Institute. Vanessa Villacorta-Sierra, MD and PCC Wellness were featured in a Dec. 14 Tribune local article about the Medical Careers Club they established at Steinmetz High School on the West Side of Chicago. PCC Wellness operates a school based health center at the school that serves not only students, but the surrounding community. The Medical Careers Club meets once a month where PCC professionals can educate and encourage Steinmetz students about careers in medicine. IAFP board chair Alvia Siddiqi, MD has been appointed to the Medicaid Innovation Accelerator Project through the National Quality Forum. The project goal is to identify quality measures for Medicaid in four priority areas.